All classroom guides hold NJ teaching certificates. All RVCS staff are certified in First Aid and CPR. All certificated/classroom guides, and some support guides, have Wilderness First Aid certification. After living in Hoboken, New Jersey for 15 years, Ieva headed to Sussex County where she lives with her son, who attends RVCS, and her husband. Ieva joined the RVCS community in 2007. Before coming to RVCS she taught elementary and special education in several northwest New Jersey schools. Her experience helps Ieva guide her students on their educational journeys at RVCS. Ieva has many passions including, yoga, baking, reading, hiking and swimming in the Catskill mountains. She brings these passions into her classroom whenever she is able. Ieva is also bilingual in Latvian and is actively involved in the Latvian community worldwide. Originally from the New Jersey Pinelands National Reserve area in Medford, Krissy moved back to New Jersey after spending twelve years traveling and honing her skills in forest conservation and experiential education. Her background includes Vocational Forest Conservation education, Experiential Learning in Sciences, and Reading Intervention. She taught at the elementary grade level in the public and private sectors, as well as provided Gifted and Talented online education. Joining the RVCS staff in 2015, she shares her avocation and skills in Tai Chi and yoga with colleagues and students. She lives in Sussex County with her husband and son, who attends RVCS. Krissy brings her love of hiking, skiing, swimming, paddle boarding, reading, and music to school with her each day. Nancy grew up in the Flanders/Mount Olive area of New Jersey. Nancy began working as a full time Guide at RVCS in 2012. Nancy brings a diverse background with her, with experiences ranging from teaching reading to adults in the New York prison system to being an FAA certified flight instructor and flight school operator. She also designed and organized aeronautical science camps and youth programs. Nancy enjoys camping, open water swimming, trail running, SCUBA diving, traveling, and learning about other cultures. Josh grew up near Binghamton, New York, and began his educational journey at The Susquehanna School, an alternative K-8 school built on democratic values and child-centered learning. After leaving law, he taught for six years in public schools in New York State, joining RVCS in the 2018-19 school year. Joshua’s passions and interests include reading, writing, weightlifting, cooking, folk music, chess, history, law, languages, hiking, and immersing himself in the natural world with his wife and son. His professional interests include developmental reading, mathematics, problem based learning, and pedagogy. He is excited to share his enthusiasm for learning with students, colleagues, and community at RVCS. Dan grew up in northern Maryland, just outside of Baltimore. He initially moved to northwest New Jersey to teach outdoor education at YMCA Camp Mason, and has stayed in the area because of RVCS, where he can combine his passions for teaching and outdoor education. Dan joined the RVCS community in 2013. His eclectic background, including a tour in the Peace Corps in Senegal, West Africa, makes Dan a great addition to the RVCS community. Dan enjoys camping and traveling abroad. He also volunteers his time with Eden’s Rose Foundation, which supports women’s empowerment and community development around the world. Kasey grew up in Madison, New Jersey and is a lifelong outdoor-enthusiast and advocate of experiential education. She has extensive training and participation in programs such as Outward Bound, Project Adventure, Trail to Every Classroom, and other outdoor personal development and team building programs. She started her career working with troubled adolescents, helping children and families stay together in their home communities. Inspired by the positive experience of her own children’s time at RVCS, she joined the staff in 2006. She uses her multi-faceted outdoor skills, including her experience hiking the Appalachian Trail, to lead students on yearly field expeditions that strengthen students’ abilities to adapt to the rigors of hiking, cooking, and camping in the wild. Mike grew up in nearby Sussex County, and has been a Guide at RVCS since 2005. He is inspired by the work of Rudolf Steiner, bringing his growing understanding of Anthroposophy and biodynamic agriculture into his work with students. He facilitates hands-on work with students such as building root cellars to store vegetables grown by the students, cooking, and spoon carving to introduce colonial crafts. Mike enjoys cooking and gardening on his small farm with his wife and children. Becky has a love for sociology, community service, and the natural world. While at Centenary College, she participated in three expeditions to New Orleans to rebuild after Hurricane Katrina. Becky has furthered her education in Earth Literacy, Sustainability, Experiential and Outdoor Education, and Project Based Learning since she started working at RVCS in 2009. Becky enjoys spending time with her husband and children, hiking with her dogs, tending to her chickens, needle felting, and cooking and preserving food. Alyssa grew up in Connecticut and first came to the area to work as a Park Ranger in the Delaware Water Gap National Recreation Area. Alyssa has been a Guide at RVCS since 2011. Earlier in her career, Alyssa led outdoor adventure trips for students and worked as an environmental educator at Shaver’s Creek Environmental Center. Passionate about service to others, Alyssa was also a teacher trainer focusing on literacy development during her tour in the Peace Corps. Alyssa enjoys camping, swimming, and introducing her two young children to the wonders of the natural world. Mark grew up outside of Philadelphia, PA. He moved to the area in 2011 to work as a Park Ranger with the National Park Service and joined the RVCS community in 2012. Mark developed a passion for learning about the natural world as a child, and works to inspire his students to do the same. Before RVCS, he was an environmental educator and park ranger at various nature centers and parks in both Pennsylvania and New Jersey. 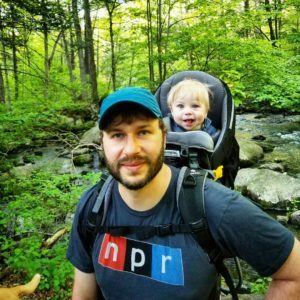 Mark brings his passions for gardening, food preservation, kayaking/canoeing, hiking, backpacking, camping, birding, wild food foraging, and woodworking into his classroom on a daily basis. Julia is a native New Jerseyan who has also lived in Kansas and Vermont. She and her husband moved to Sussex County in 2013. Julia taught at an environmental Charter School for 16 years and joined Ridge and Valley Charter School in 2018-19. She has experience developing curriculum with the Cloud Institute for Sustainability Education and loves to share outdoor hands-on experiential learning with students. Julia is an avid gardener and helped design the garden, and supported it’s relationship with the school’s lunch program, at her previous school. She is passionate about native plant cultivation as well as the healing properties of plants. Julia and her husband have traveled cross-country through the United States and camped in many national parks. While living in Vermont, Julia was a professional pastry chef, and has an enthusiastic interest in baking. She enjoys biking, hiking and skiing, playing the guitar and singing. Julia and her husband have four adult children and one granddaughter. Jessica grew up in the ridge and valley region of New Jersey. As a teenager she discovered Genesis Farm after searching for a deeper context of meaning in her life. She spent time studying cosmology at Genesis Farm in the hopes of gaining perspective about the place of the human in the natural world. She went on to work in North Carolina at The Center for Education, Imagination and the Natural World, and Pickards Mountain Eco Institute where she had the privilege of working with amazing mentors in the fields of cosmology, education, anthroposophy, wild edibles, medicinal plants, and sustainability. After traveling, studying, and working in various places she decided to return to the region to continue this work and joined the RVCS community in 2016. Jessica’s hobbies include hula hooping, acro yoga, studying plants, and being in the woods. She lives in the local area with her husband and two young children. Maxine grew up in northwest New Jersey and has a deep connection to the land here. She joined the RVCS community in 2015. Before coming to RVCS, Maxine spent a full season as an apprentice at the Community Supported Garden at Genesis Farm in Blairstown. In addition to enjoying getting her hands dirty, Maxine has a passion for the arts. She taught ceramics at Oak Crest Day Camp and was also the featured young artist for the Ars Musica Chorale. Maxine enjoys opera singing, rock climbing, gardening, painting, exploring, geocaching, and participating in Revolutionary War reenactments. Tyler grew up in the Blairstown area. After graduating from Blair Academy, he spent some time traveling and living on the southeast and western coasts of the US. He joined the RVCS community in 2016. He is a writer and has spent the past few summers traveling to Quebec City, Canada to pursue his craft. He returned to the Blairstown area to raise a family. Having recently graduated from Centenary University with a degree in English and a concentration in Creative Writing, he looks forward to connecting language with creativity and interconnectedness to the world around him. 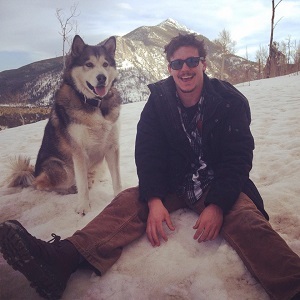 Tyler’s passions include his family, hiking, traveling, poetry, novels, music, and cultivating friendships. He is also interested in pursuing these passions while learning to better understand his place in the universe. He has always seen the world as a classroom, and envisions the RVCS mission as one that he can both learn from and support. A native of Sussex County, Kris joined the RVCS community in 2013 after her son began attending the school. Kris has a diverse professional background, with experience teaching elementary education, special education, and middle school literacy. As a staff developer, she has trained other teachers in the finer points of literacy and reading education. 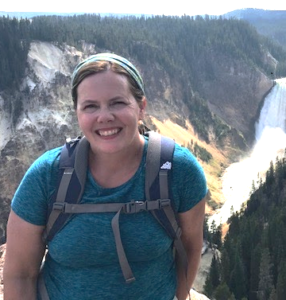 She enjoys sharing her passions for lifelong learning, experiential learning, place-based and outdoor education, humane education, reading, and writing with her students. Maggie, whose children attend RVCS, is a native of the Highlands area of northwestern New Jersey, where she continues to live with her family. Before joining the staff at RVCS in 2009, she had experience teaching all subjects in different public middle schools and high schools in New Jersey. Her experience includes training in Applied Behavior Analysis (ABA) therapy and relationship-based (DIR) therapy. She volunteers as a developmental interventionist, as well as at her local animal shelter. Maggie takes the RVCS philosophy into her home life, where she and her family enjoy the benefits of growing and preserving their own food, raising chickens, and generating alternative sources of energy for their home. She also enjoys sharing her knowledge of health, nutrition, hiking, running, and biking with her students. Bradley grew up in Fredon, New Jersey, just a few miles down the road from RVCS. His deep knowledge and connection to the land can be traced back to his childhood. Bradley joined the RVCS community in 2006. Before RVCS, he worked as a field biologist and environmental educator and brings his passion for these things to his work with the students of RVCS on a daily basis. When he isn’t at RVCS, Bradley can be found birding, playing music, hiking, snowboarding and camping. Tonya is a native of northern New Jersey. She joined the RVCS community in 2009 after working as an environmental educator at a YMCA Camp and teaching at a private school. In addition to gardening at home with her daughters, who both attend RVCS, she enjoys working in the family vineyard with her husband. She also loves spending time exploring the various lakes, streams, and rivers throughout this region of the country. A lifelong learner, Dagmar enjoys sharing experiences with kids of all ages. A former youth, teen, family, and international programs director for the YMCA, Dagmar has spent the last several years being mostly mom to two beautiful daughters and working/volunteering part time as a sports and games instructor and coach, state park educator, and consultant/trainer to youth services providers. 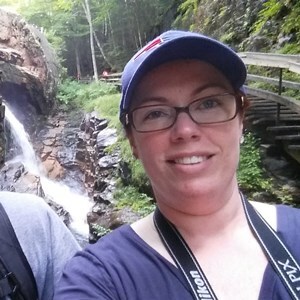 Dagmar loves reading and spending time outdoors hiking, biking, skiing, kayaking, exploring, and camping. She’s been to over a dozen countries as a group leader or on her own, usually with a bike and tent as transportation and lodging. Her newest pastimes include beekeeping and fly fishing, both motivated by her active daughters. Dagmar, who lives in Green Township with her husband and teenage girls, was very excited to join the RVCS team in 2018-19. Sundae grew up in Andover, New Jersey where she still lives today with her two daughters. Sundae joined the RVCS community in 2006. Prior to her years at RVCS, Sundae was an AmeriCorps Watershed Ambassador and was a watershed liaison at the Wallkill River Wildlife Refuge. Outside of school Sundae teaches a baton twirling class, is the acting secretary for the Historical Society of Andover Borough, and volunteers at the Andover Museum. She enjoys kayaking, hiking, and playing outside with her daughters. Sue grew up and has lived in northern New Jersey for most of her life. She worked as a school psychologist in traditional public schools in New Jersey for 6 years. Becoming a mother moved her along her holistic journey. Sue was particularly inspired by her affiliation with the Holistic Moms Network, where she met like-minded people who connected her to RVCS’ holistic educational model. Sue began working at RVCS in 2009 and her daughters now attend RVCS. She enjoys hiking, downhill skiing, inline skating, reading, yoga, meditation, and contra dancing. Lisa moved to northwestern New Jersey after living and teaching in the northeastern US and Germany. 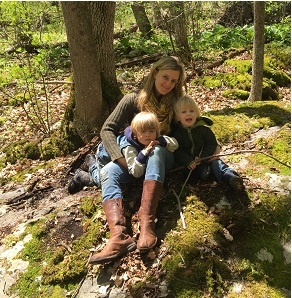 She discovered RVCS while looking for alternative to traditional public schooling for her own children, two of whom attended and graduated from RVCS. Lisa is a founding Guide since the school opened in 2004 and a member of the Leadership Team since 2008. She brings an extensive background in early childhood education, alternative educational practices, place-based and project-based education, and educating for sustainability. Most recently she has been a participant in the Education for Sustainability Leadership Academy at Shelburne Farms, and has worked on developing curriculum through both Shelburne Farms, The Cloud Institute for Sustainability Education, and the Appalachian Trail Conservancy’s Trail to Every Classroom program. Lisa is passionate about helping children deepen their understanding of, and connection to, our bioregion, particularly through their experiences with local farms and food. She is a longtime member of the Community Supported Garden at Genesis Farm and enjoys swimming, ice skating, singing, reading, theater/film, cooking, traveling, and spending time with her husband and three children. Traci grew up in central New Jersey. She spent time out west, returning in 1998 and starting a family. Traci joined the Trustee circle in 2003, and then became the Curriculum Coordinator and a member of the Leadership Team after the school opened. Traci has a great respect for and kinship with the natural world, and uses that as a foundation to learn about and promote actions that are in alignment with the elemental processes of the universe, helping shape the school and its mission. She brings together her beliefs and practices of alternative forms of education, including Montessori, Waldorf, and Democratic, at RVCS. Traci enjoys organic gardening, cooking, yoga and tai chi, singing, making art, dancing, drumming, and spending time with her family. She is proud and grateful that all three of her children have had the opportunity to attend RVCS, and cannot imagine a more wonderful school experience for them. 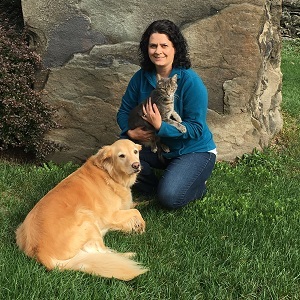 After living in Essex County for most of her life, Theresa moved to Warren County, NJ in 2006 where she lives with her husband and pets, enjoying a slower pace. Theresa began her journey in education as an elementary teacher, then worked as an administrator in charter school and private school environments. She joined the RVCS team in 2018 as the Business Coordinator where she combines her experience, passion for working with children, and interest in finance. Theresa loves to read and when not cuddled up with her pets and a book, she can be found embroidering, scrapbooking, gardening in her backyard, or exploring the White Mountains with her husband and friends. Jen spent her childhood in New Jersey and had never heard of Blairstown until, as an adult, she went to an RVCS open house. She fell in love with the area, community and the school and relocated to Blairstown in 2012. Jen first became involved with the school as a parent volunteer, and then began working as a Guide in 2010. 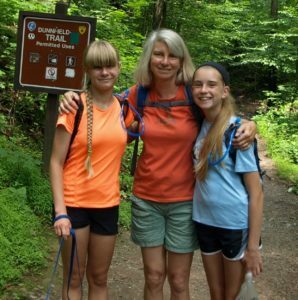 In her free time, Jen enjoys volunteering with the American Cancer Society, hiking, reading, and taking adventures with her two children who have been students at RVCS since kindergarten. Donna grew up in northern New Jersey and relocated with her family to the Blairstown area in 2000. She has worked as a registered nurse for 40 years and began working at RVCS in 2005. Her eclectic nursing experience in emergency rooms, pediatrics, early intervention programs, and camps makes Donna well suited to her work at RVCS. Donna enjoys sewing, handcrafts, gardening, and camping. Linda grew up in New Jersey and Connecticut. She moved to Blairstown in 1993 to raise her two sons in a rural environment. Linda is a licensed speech and language pathologist and began working with RVCS students in 2007. She has 35 years of experience specializing in working with school-age children. In her free time she loves to ski, dance, travel and play the guitar. Karin grew up in rural northeast Pennsylvania and currently lives in the Pocono Region of Pennsylvania. Karin joined the RVCS community in 2016. She is a licensed and registered occupational therapist with 18 years of experience working in a variety of settings, including many of those years providing therapy in Pennsylvania and New Jersey schools. Karin has a passion for working with children and helping them to be more successful in their educational environment. She enjoys hiking, fishing, gardening, cooking, biking, and camping with her family.